French luxury brand Céline has further expanded its presence in Vancouver with two new shop-in-store boutiques. 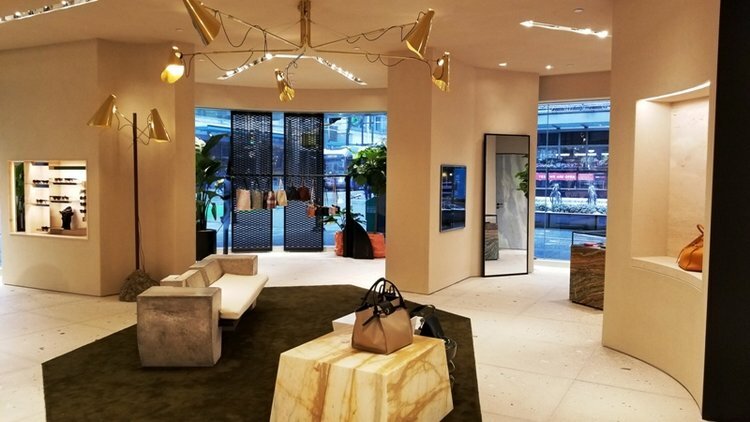 A couple of months ago, LVMH’s Céline opened a women’s ready-to-wear boutique on the second floor of Holt Renfrew in CF Pacific Centre and last week, it unveiled a beautiful new accessory boutique in Holt’s expanded street-level accessory hall. With the angular store interiors and product directly viewable from busy Granville Street, the modern interior design is similar to other Céline stores around the world. Danish artist FOS is responsible for the creation of custom pieces inside, such as a large copper ceiling chandelier and terracotta sculptures. A concrete edged sofa is centrally positioned with podiums of onyx and tropical plants (including a banana tree) being used to create an intimate industrial space with an ambience that perfectly reflects the sharp style of the brand. The new Holt Renfrew Céline boutiques has put Holt’s in direct competition with Nordstrom at CF Pacific Centre, which also features separate shop-in-store Céline accessory and ready-to-wear boutiques. Sources say that Céline does very well at Vancouver’s Nordstrom flagship — as do many luxury brands and as a result, Nordstrom’s Vancouver store is a top performer in the chain along with the Seattle flagship. It is not the first time that Céline has had a physical presence in Vancouver — for a time in the 1990’s, Céline operated two standalone franchised boutiques in the city centre, which were part of the Collections International fashion group. A street-front Céline boutique was located at 755 Burrard Street next to a Chanel boutique — an expanded Coach store now occupies both of the spaces. As well, at one time, the Pan Pacific Hotel boasted a luxury offering that included boutiques for Céline and Valentino, as well as shops such as Furs by Jacques and Farideh French Imports. Céline is expected to continue its Canadian expansion in Holt Renfrew on Bloor Street in downtown Toronto. More details will be revealed shortly. See more photos, provided by Helen Siwak, below as well as a video of the Holt Renfrew boutique.